There is a new missing person on Avisderecherche.tv. 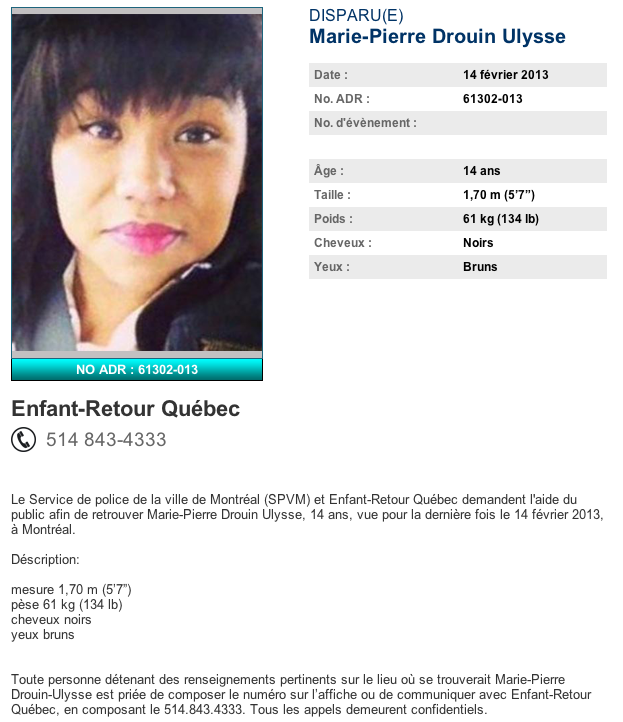 This teenager has been missing since February 14th in Montreal. She measures 1.70 m (5’7 “) and weighs 61 kg (134 lb). She has black hair and brown eyes. She does not appear to be listed in the Canada’s missing database. For five years now you have not been a part of my life. I hope that this is a personal choice, but doubt and anxiety sober me. The reality of your loss sinks in every day, but I cannot adapt to the worries. It gnaws the heart… Responses that never come. Your voice only resonates in the past. In the meantime, I’m still looking for you. I wish I could express to you once more the love I have for you, which in turn carries the hope. The words are missing, just as you are, and I miss you. Fortunately, I still have the memories and hope. I have dreams that are like swallows. Write me if you can (http://www.findmarilyn.com). If you cannot, know that I will not forget you. Read the press release by clicking on the document below. With the continued support of the Missing Children’s Network organization and Mrs. Pina Arcamone, the new campaign will include the following initiatives. -5000 Posters distributed in 66 establishments Café Dépôt in the Province of Québec. -Display on giant screens in Caisses Desjardins in the Province of Québec. -Distribution of flyers in Hochelaga-Maisonneuve, the Montréal neighborhood where Marilyn lived before her disappearance. 2. A pan-Canadian campaign will begin shortly in collaboration with the Canadian Centre for Child Protection. -On 19 February, the photo of Marilyn appeared on the recipe of the day by the producer of vegetables Manitoban Peak of the Market sent to 50,000 subscribers to its newsletter. -Rogers and CIBC Bank will proceed to print Marilyn’s photo on the envelope containing the monthly invoice to their customers. 3. Sun Youth has also extended its offer of a reward and will provide a sum of up to $ 10,000 to anyone who would provide information needed to find the young woman. 4. Thank you to a special police officer in the Montreal area that continues to send information to Marilyn to thousands of colleagues, community organizations, etc.. Thanks to initiatives and efforts of Missing Children’s Network, AFPAD, Sun Youth, friends and colleagues of the family of Marilyn Bergeron, nearly a million people will see the photo of Marilyn across the country. Here is the list of events or documents related to the 5th anniversary of Marilyn’s disappearance. 1. Invitation to a press conference by the Missing Children’s Network and the Québec City Police Department. 2. Press Conference on February 14, 2013 by Mrs. Andrée Béchard (Marilyn’s mother), Pina Arcamone (Executive Director of Missing Children’s Network) and Catherine Viel (Spokesman of the Québec City Police Department). 3. Press release by the Missing Children’s Network ”A Widespread Operation to Locate Marilyn Bergeron Missing Since 2008“. 4. The details of the new campaign to find Marilyn. 5. Message by Marilyn’s parents on February 13th, 2013. 6. Missing for Five Years, Open Letter to Marilyn, on February 18th, 2013. 7. Message from Senator Pierre-Hugues Boisvenu. 8. The article or articles recently published in the media can be found in the Press section. January 31, 2013 — OTTAWA —The RCMP’s National Centre for Missing Persons and Unidentified Remains (NCMPUR) is pleased to announce the launch of a new national website. The NCMPUR website, located at www.canadasmissing.ca, is Canada’s first national website designed to engage the public in reporting tips and information related to ongoing cases. The site is a key component of the federal government’s commitment to the Canadian public to help identify remains and bring the missing home. “This website gives the public a chance to make a difference in finding some of Canada’s missing. Each person who takes the time to visit canadasmissing.ca could help bring a loved one home to their family,” said the Honourable Vic Toews, Minister of Public Safety. “Canadasmissing.ca provides law enforcement, medical examiners and chief coroners with a powerful tool in resolving missing persons and unidentified remains cases and gives the public an easy-to-use access point to ensure that relevant information is received by investigators,” said RCMP Commissioner Bob Paulson. While in some cases many years have passed since a person has gone missing or human remains have been located, police, medical examiners and chief coroners remain committed to resolving these cases. The participation of the public is often vital in locating missing persons and identifying human remains. Regardless of how old an investigation is or how insignificant a piece of information may seem, a member of the public may have the one key element needed to successfully solve a case. The website is operated by the RCMP’s National Centre for Missing Persons and Unidentified Remains. The cases on the new website are a sampling of cases from across Canada. 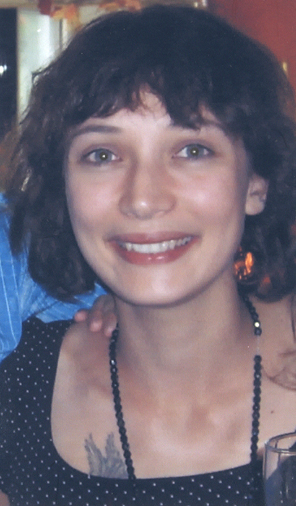 The information contained on canadasmissing.ca is submitted by police officers, medical examiners or chief coroners. Cases may be added to the website at the request of primary investigators. All tips and information received from the public through the website will be relayed to the investigating agency. To visit the site, please follow the link below. To this date, there is still no database for missing people and unidentified remains. There are also no statistics available on missing adults in Canada. A centralized repository and resource center should be available for searches by the general public, medical examiners, coroners, law enforcement officials, etc. to help with solving cases. There is finally a centralized database of Canada’s Missing. The National Centre for Missing Persons and Unidentified Remains (NCMPUR) of the Royal Canadian Mounted Police (RCMP) is Canada’s national centre that assists law enforcement, medical examiners and chief coroners with missing persons and unidentified remains investigations across the country. The NCMPUR incorporates the existing National Missing Children Operations (NMCO).